Tokyo is a very big city. Actually big isn't the right word, it's huge. When you are figuring out which districts are best to explore - or even stay in - it can be tough. First, before we even get into it, don't worry too much about where to stay to see everything. The subway in Tokyo is not only extremely encompassing, but it is also very easy to navigate. Read on: Full article on the Tokyo subway here. So, while it may seem overwhelming, my advice is as long as you stay near a subway station you'll be ok.
Alright, enough with the pep talk, let's get into it. Shibuya is one of the best districts in Tokyo. I would suggest heading there first - at least that's what I did! There are tons of lights and all the major brands for shopping. Think of it like Times Square on steroids. Shibuya Crossing, which is the largest crossing in the world and basically is the coolest thing to see in person. It sounds like just a crossing, I know. But it is AWESOME. 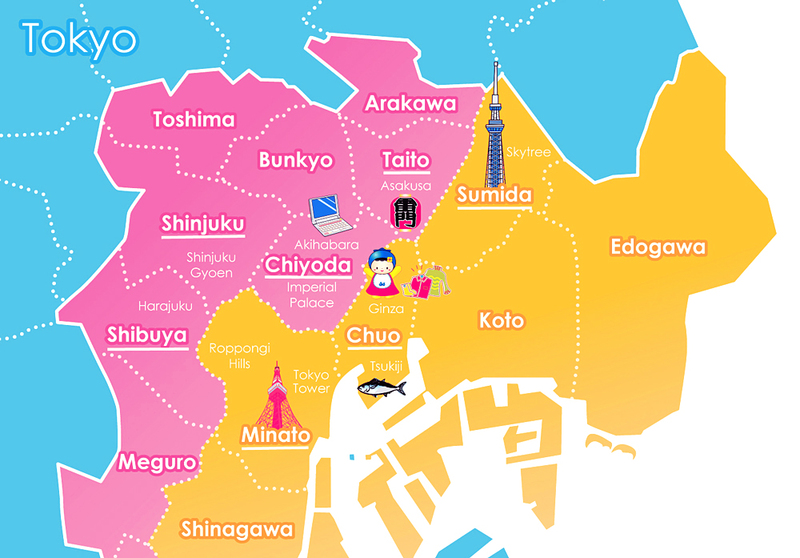 Check out the best places to view the Shibuya Crossing here. Near the crossing, in the huge Shibuya train station, is the Myth of Tomorrow mural. The mural shows the bombing over Hiroshima and definitely deserves a look. It is on the second floor. 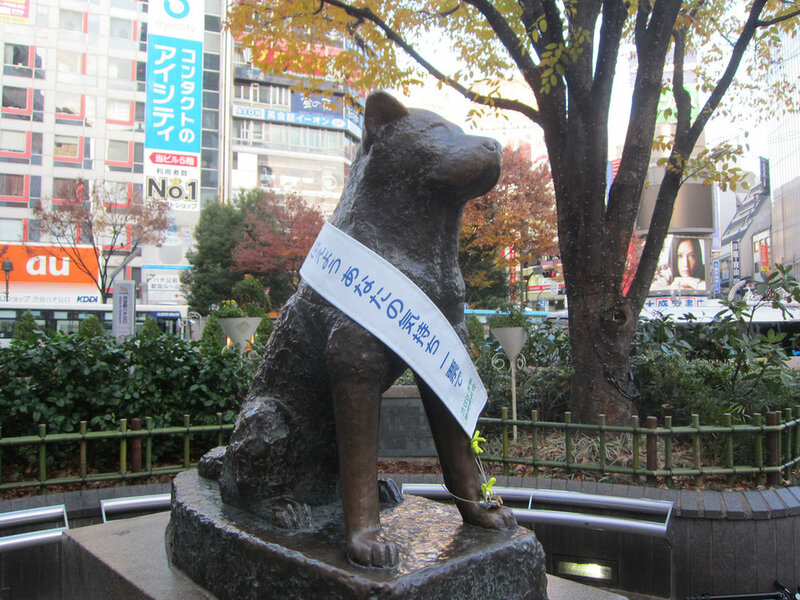 Finally, there's a great dog statue - Hachikō Statue - that has the saddest story along with it. An Akita dog came to Shibuya station every day to meet his owner after work. The owner died in 1925, but the dog continued coming to the station every day for 10 years until its death. The story became legend, because it's awesome - duh, and a small statue was put in for the dogs. Once you're hungry I definitely recommend Uobei Sushi. Every seat has an iPad, you order from the screen and then sushi (and other dishes) come delivered to you on a conveyor belt in front of you! It is such a cool experience and super cheap! The biggest hub in Tokyo. Has the huge train station, city hall, plus shopping and nightlife. Before you head to Tokyo, make sure you buy tickets to Robot Restaurant. 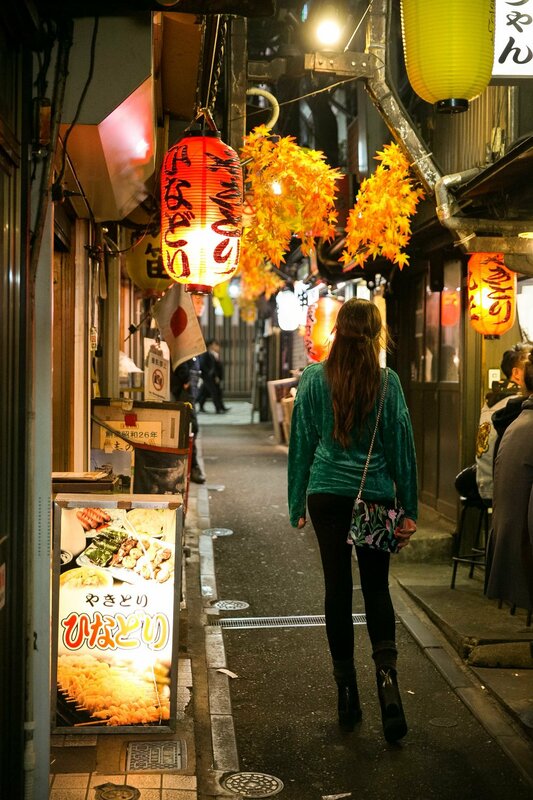 After the show, take a walk over Ramen road for some great food. And then to Golden Gai for a cool bar experience. 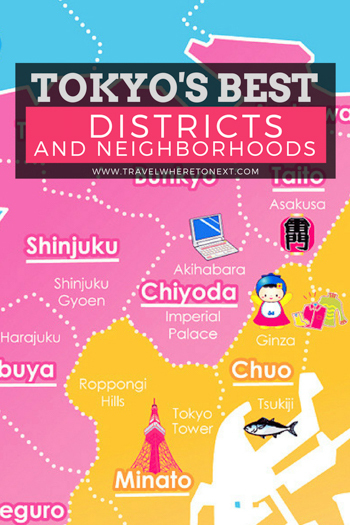 Harajuku is a district you can't miss out on! It is the center of Japanese youth and fashion culture. Also, it's extremely colorful. A great park to walk around is Meiji-jingu. Visit at 8am or 2pm to watch the twice daily nikkusai - a ceremonial offering of food and prayers to the gods. Shop on Takeshita Street, the main strip of quintessential Harajuku, at the various amazing boutiques. There are many shops at all price ranges! For a great souvenir, find a Purikura. I went to Purikura land, follow the steps down to an entire basement filled with over 20 Purikura machines. So what is Purikura? Basically, it's a photo booth that is like Snapchat in real life. You take pictures with very Japanese like filters (think doll like features). After you take the pics you can then customize it with pages and pages of stickers, makeup, and filters to add to the photos. Hungry? Don't miss Totti Candy Factory. 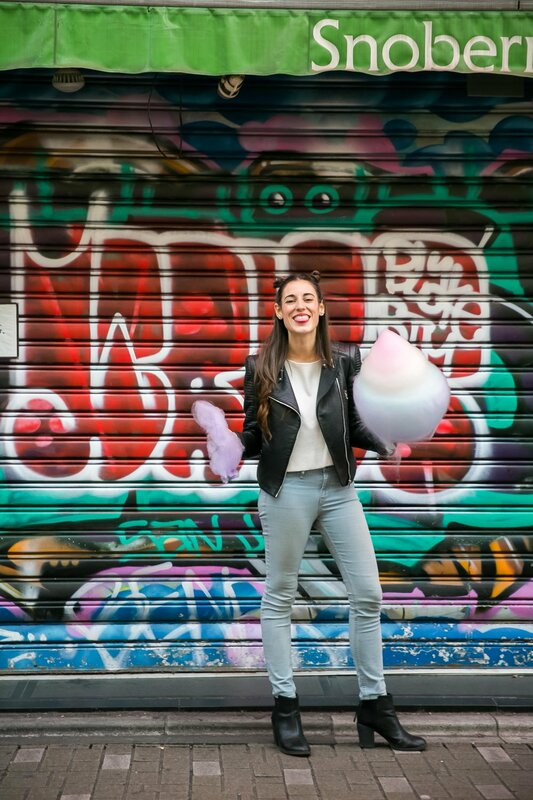 They make cotton candy that is super colorful and literally bigger than the size of your head. For a bigger meal, I suggest Kawaii Moster Cafe. The food isn't the greatest but the experience is worth it. So colorful and what the Japanese call grotesquely cute (it's a good thing). An upscale neighborhood full of funky boutiques and excellent restaurants. The main canal is one of the best places to catch the cherry blossoms blooming in the spring. Head here to tour the Imperial Palace and gardens. The Imperial Palace is also where the original Edo Castle once stood! The rest of the neighborhood that surrounds the palace is a surprisingly modern place with huge skyscrapers. You also can't miss Tokyo Station which was renovated and expanded in 2014 for the centenary celebration. Once you get hungry, head over to Rose Bakery for some amazing baked goods. Or, if you want an upscale tea date (with violins and great food) try out The Peninsula Tokyo, I can't recommend it enough. A neighborhood known for its amazing nightlife. Home to the beautiful Ritz Carlton Tokyo, which I highly suggest you stay at! Make sure to check out Roppongi Hills. A huge mall/museum/outdoor architecture wonder all rolled into one. The other thing you can't miss here is Tokyo Tower - the red Eiffel Tower looking structure. Tokyo's classiest (read super expensive) neighborhood. Here you can find $10 cups of coffee, high-end department stores, tea houses, and gorgeous gardens. Close to Ginza is the Tsukiji Fish Market. If you want to visit it for the famous fish auction you will have to queue up at 4 am. For a more relaxed experience, just head to the outer market between 9 - 11 am for some food. Home to the gorgeous Senso-Ji temple. Also holds old merchants quarters and nostalgic bars. This is the place to take a guided tour. It has a rich history full of theater and red-light districts.